VANCOUVER, BC, June 9, 2011. Mirasol Resources Ltd. (TSX-V: MRZ, Frankfurt: M8R) is pleased to announce the results for 15 additional drill holes from the Phase 2 diamond drilling program at its 100%-owned, Virginia Project in Santa Cruz province, Argentina. Eight of the 9 new holes reported here contain significant intercepts of silver mineralization, calculated at greater than 30 g/t cut-off grade (Table 1, Figure 1). This includes a true width intercept of 35.9 metres of 200 g/t silver including 5.7 metres of 669 g/t silver in VG-068 in Julia Central. 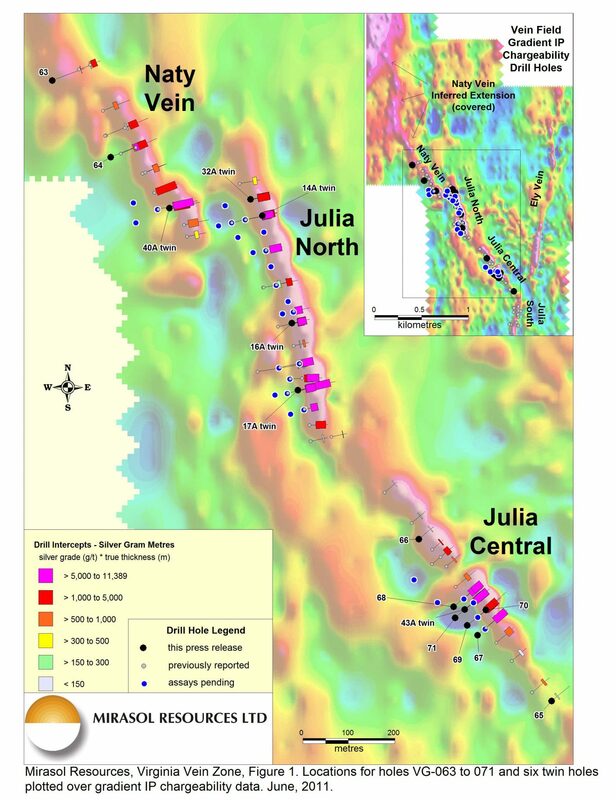 Silver mineralization intersected at Julia Central (Figure 2) and Naty (Figure 3) remains completely oxidized to depths tested in excess of 60 metres down dip, and as previously reported, intense oxidation is known to extend below 100 metres depth in the Julia North structure. 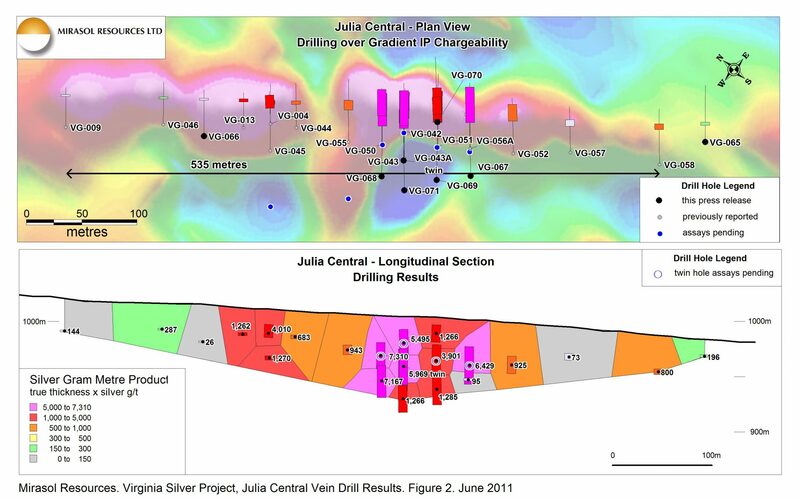 New holes at Julia Central (holes VG- 68, 69, 70 and 71) further define a silver shoot of at least 100 metres length and 75 metres depth. Core recovery in these holes shows a marked improvement relative to earlier drilling, with all intercepts having core recoveries of 83 percent or better, and most reporting recoveries of 90 percent or better (Table 1). Notes: All analyses done by ALS Laboratory Group. Core recovery is the length weighted average of the intercept quoted. In addition to the holes published here, Mirasol has completed another 14 infill and expansion holes on the Julia North, Julia Central and Naty veins, and 15 twin holes, and furthermore has drilled 6 holes on other previously untested vein targets elsewhere at Virginia. Assays for all of these holes are pending. Also reported here are a series of six twin holes which were undertaken in the presence of Mirasol’s drilling consultant in April, with the objective of improving core recoveries in the most challenging areas drilled up to that time (news release April 19, 2011). The twin holes were drilled with their collars sited approximately one metre behind the original hole and inclined three degrees steeper, in order to intercept the same geological structures as nearly as possible. Recoveries were greatly improved in these six holes and now range from 84 to 98 percent, which are excellent results by any standard. Visual comparison of cores from the twin holes with the original holes with poor recovery shows that the material previously lost was soft clay matrix and fault material surrounding the mineralized quartz veins, or occurring as matrix to quartz breccia veins. The soft clay material was likely washed away during the drilling of the original holes, but through a series of technical improvements was recovered in the twin holes. Sampling of the twin holes suggests somewhat lower grades on average than in original holes. Mirasol ascribes this to a concentration effect of higher grade quartz fragments and washing away of lower grade clay material in the original holes. Thus, the twin holes with higher recovery are believed to be more representative of the in-situ geological structures and mineralization. Previously, hole VG-048 was twinned and both the twin VG-048A and original hole were reported on (news release May 12, 2011). In that case no significant change in average grades was detected when recovery was improved. It is interpreted that washing of clay fines in holes lacking quartz vein material does not produce the same concentration effect noted in the six holes with twins reported here (Table 2). Notes: All analyses done by ALS Laboratory Group. Notes 1 through 4 are the same as for Table 1. 5. Previously published but repeated here for comparison to twin hole. Holes VG-14, 16 and 17 intervals were previously calculated using a 50 g/t cut-off, but have been recalculated here at 30 g/t cut-off for direct comparison with Phase 2 holes. Twin holes are designated by the letter “A”. 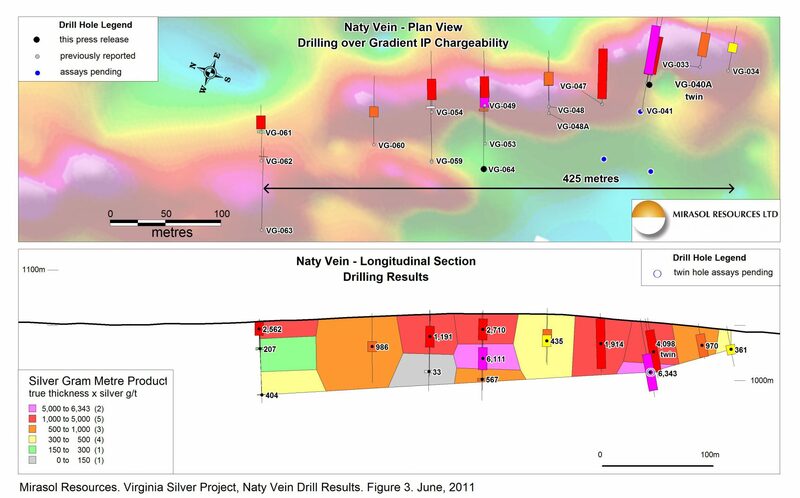 Based upon this new information, Mirasol has identified all holes on the Virginia Project that may exhibit a similar combination of quartz with high grades and soft clay material, and which returned poor core recovery, and has drilled an additional 15 twin holes at Julia North, Julia Central and Naty veins to ensure the highest quality of data is available. As in the six twin holes reported here, marked improvements in recovery were the norm and the additional twin holes are currently being processed which will be reported in due course. Given that Mirasol initially selected holes with the highest grade and poorest recovery for the initial six twins, it is hoped that the second round of twin holes will show less variance than those currently reported. In the course of drilling twin holes and additional holes at Julia North, Mirasol has discovered that the low grade halo of silver mineralization on the east side of the high grade structure can be substantially wider than previously thought. This is exemplified by VG-017A, where this twin hole was extended well to the east and produced an intercept, at a 30 g/t cut-off, of an estimated true width of 63.8 metres grading 125 g/t silver with 98 percent core recovery (Figure 4, plan view ). Recently Mirasol expanded the ground magnetic and Induced Polarization (IP) coverage at Virginia to the north and east where a stream sediment geochemical survey has indicated anomalous silver and lead values. 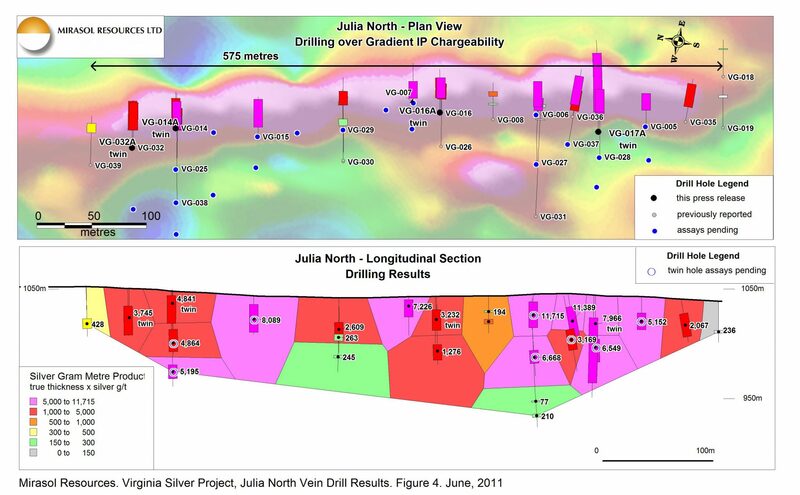 Features showing chargeable IP responses have been identified north and northeast of the principal Julia and Naty drilling. Prospecting, rock sampling and surface mapping have also been completed in this area. Results will be reported when all information is available and interpreted. Mirasol’s management anticipates a strong flow of news from Virginia in the coming months from the Phase 2 Virginia drill campaign. The 2010-2011 southern field season has been one of tremendous advances in knowledge and understanding of the Virginia silver project. Drilling results to date have identified significant silver mineralization over substantial widths and strike lengths. The Virginia Vein zone’s apparent continuity, deeply oxidized nature, and near-surface configuration, are all considered positive features that support potential for definition of significant bodies of high quality, silver mineralization that may be amenable to low cost, open cut mining techniques.